It’s always important to take care of your teeth. When you have braces, though, it’s a little more important and a bit more difficult to do. That’s why you should use the best toothbrush for braces. We researched some of the best-selling and most unique items out there to put together this top ten list. Hopefully, it will help you find the best one for you. Now, let’s look at some of the features you need to know when shopping. Electric: A lot of our top picks are electric but, believe it or not, we were most surprised by the ones we found that weren’t. Electric toothbrushes have a lot to offer and they’re really effective with braces. 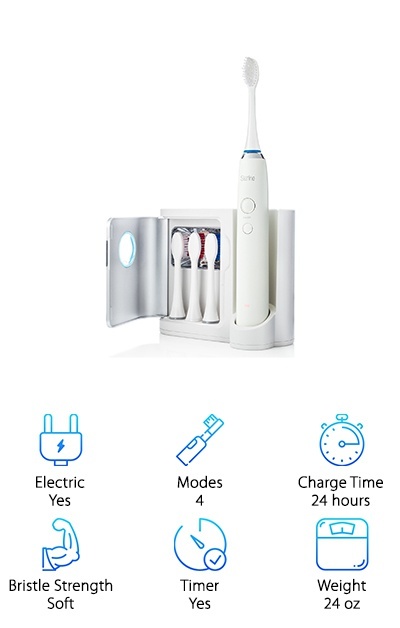 Modes: Most electric toothbrushes have multiple modes. These vary a bit between models but usually, you’ll find a regular cleaning, gentle, whitening, and even massage mode. Gentle is usually better for younger users who are also more likely to have braces. Charge Time: Most of these need a 24-hour charge time. What this means is you’ll to charge the battery for 24 hours to get it fully charged. That being said, you don’t really need a full charge to use them. Bristle Strength:- Bristles range from soft to medium. Most of the electric ones have soft bristles. Mostly because firm bristles would be way too rough on braces. Firm bristles in an electric toothbrush would likely be too rough for anyone. Timer:- Some of the electric ones have timers that run for a 2-minute cycle, which is how long you should brush your teeth. Some also alert you every 30 seconds to move to a different part of your mouth. Weight:- All of the manual ones we chose are really lightweight, as most are. Some of the electric ones can get pretty heavy for a toothbrush when you add in the battery and attachments, though. Now that you know a little bit more about what makes a toothbrush great for braces, let’s take a look at the products we rounded up for you. If you’re in a hurry, take a look at our top and budget pick first. They’ll give you a great idea of the range that’s out there. Then, keep reading if you can because the rest of our picks are pretty awesome, too. Okay, let’s get to the best toothbrush for braces review! 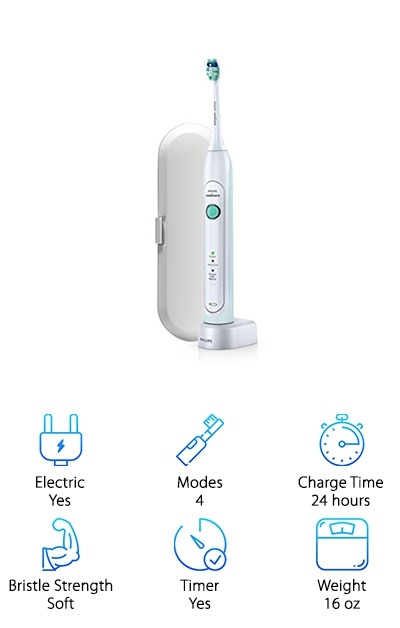 Our pick for best electric toothbrush for braces is the Philips Sonicare 2 Series electric toothbrush. It’s rechargeable so you don’t need to worry about constantly replacing the batteries. We should mention it take 24 hours to fully charge the battery but you don’t need to do that in order to use it. One of the reasons this is such a good choice for someone with braces is because it removes 6 times more plaque than a manual brush. This will help keep your teeth extra clean around your braces. The curved bristles match the shape of your teeth which helps attack plaque more efficiently and it’s ergonomic and easy to use. It also delivers an astounding 31,000 brush strokes per minute which is another reason it can get your mouth super clean. Our budget pick just happens to be one of the best manual toothbrush for braces. In fact, it probably has more features than you ever imagined a manual toothbrush could have. This isn’t the straight bristled, flat brush you might be used to. The bristles in this brush crisscross at the ideal 16-degree angle which helps them reach into all those tight, small spaces that a standard toothbrush can miss. That’s one reason why they’re so good for braces - they really clean around the brackets and can get underneath the wires because of the angle. That’s not all. 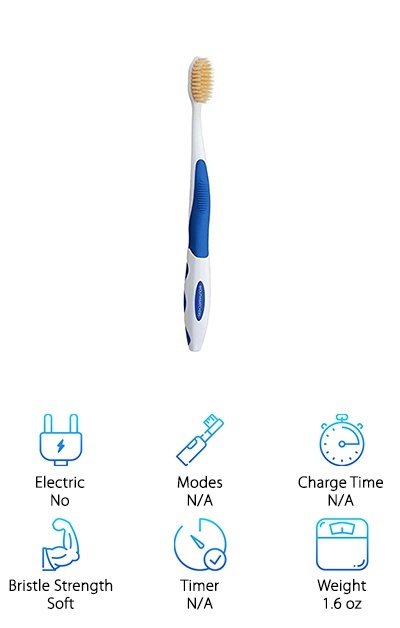 This toothbrush also comes with a tongue scraper and gum stimulating bristles to keep your whole mouth clean and healthy. Plus, it’s long ergonomic design makes it really easy to maneuver. The interesting bristles of the Triple Bristle Sonic Toothbrush are why it’s able to give such a deep clean to people with (and without) braces. The bristles are 3 sided so you can get the same amount of cleaning in ? of the time. It’s sometimes hard to get kids to brush correctly. Being able to cut down the time needed for a thorough cleaning is ideal for kids with braces. Another thing that’s great about this one is the soft bristled brush head. The get your teeth clean without damaging the hardware. There are 3 modes, too: high/clean, soft/gentle and massage. Brushing with this is really easy, too, thanks to the ergonomic design and because you don’t have to do much! The bristles really do all the work. There’s a lot to love about the Sterline Sonic Electric Toothbrush. One of the coolest things is the ultraviolet sanitizing technology. Simply place the heads in the included stand with the bristles facing into the light, wait 10 minutes and, viola! Sanitized. The brush deep cleans to remove 2 times more plaque than a manual brush thanks to the 40,000 brush strokes per minute. 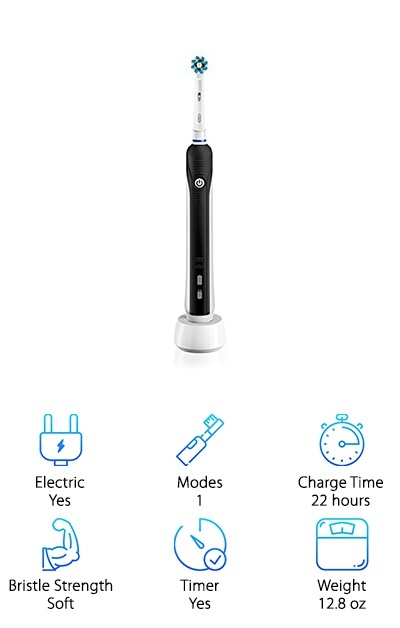 Plus, it has a built-in timer so you know exactly how long to brush. That’s not all. The 2-minute times pauses every 30 seconds so you know when to move from top to bottom and inside to outside in your mouth. 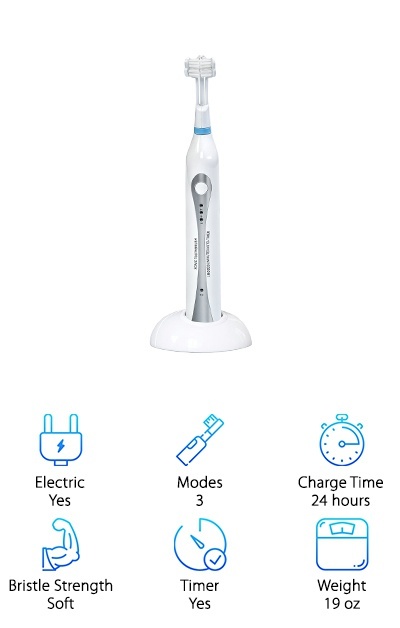 The 4 modes allow for regular cleaning, soft, whitening, and massaging. And get this: it comes with a 2 year warranty. One of the things we liked the most about the Philips Sonicare Healthy White Toothbrush is the design. It looks so sleek and modern, we wouldn’t mind having sitting on the sink in our bathrooms. Something we liked most about its performance? It can whiten your teeth up to 2 shades in only 2 weeks. It also cleans effectively between your teeth, along the gum line, and, yes, around your braces. There’s a timer with a pacer so you know how long to brush and when to move from one part of your mouth to another. There are 3 modes, too: clean mode, white mode, and sensitive mode. That’s not all. 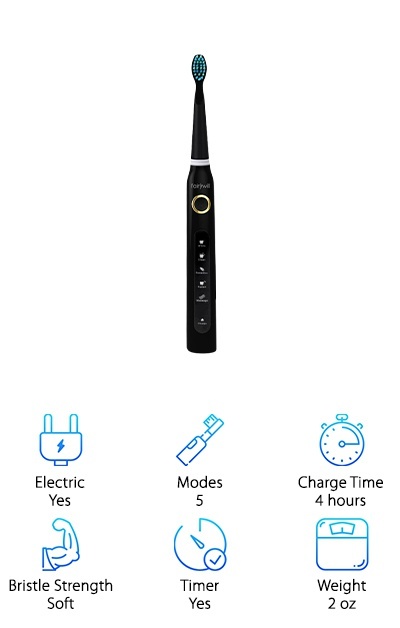 This one comes with a little kit that includes the toothbrush itself, a standard brush head, a charger, and a travel case. 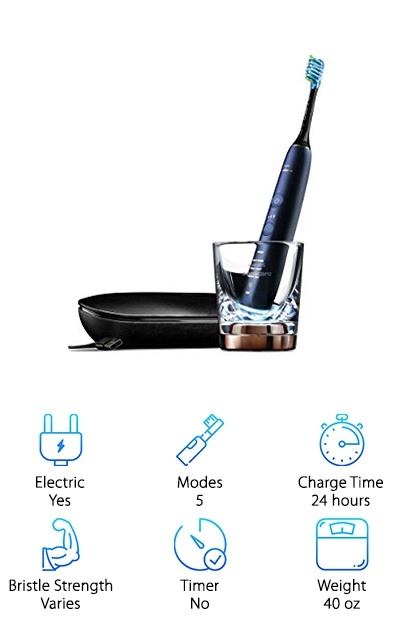 The best thing about this toothbrush is that it only takes 4 hours for a battery charge that will last for 30 days. That’s pretty remarkable and makes this a really good one for travel. If you have a child with braces headed off to camp for a week or grandma’s for the weekend, this is a great one to send with them. Plus, it uses a standard USB cable to charge so it’s easy to recharge when you do need to. This toothbrush also gives you 5 different modes: white, clean, sensitive, polish, and massage. There are just some great features to this one, too. For instance, the rounded bristles are made of Dupont nylon and are soft and conform to your teeth to get to all the hard to reach spots. We have to admit, we were kind of blown away by this unassuming looking toothbrush. Combine this with any recommended toothpaste for braces and you have yourself a pretty awesome combo. So, what makes this brush so awesome? Well, how about the silver bristle technology that naturally eliminates 99.9% of the bacteria in about 6 hours? It’s like using a new brush every time! There are 2 levels of bristles, longer ones to sneak into the areas where normal flat brushes can’t reach, which makes them so good for braces. Plus, the bristles are made of extra soft polyester. They’re gentle on your teeth, gums, and braces plus they outlast regular nylon bristles. That’s not all. They’re also ergonomically designed and have a soft grip handle so they’re comfortable to grip. 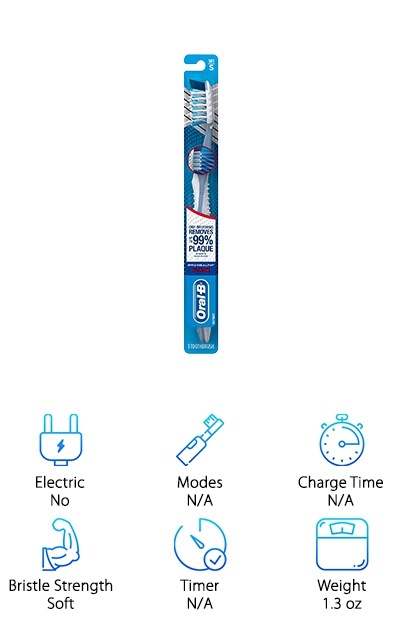 Oral-B put their CrossAction bristles on an electronic toothbrush and the result is a particularly good toothbrush for braces. The brushes are angled at 16 degrees, the perfect amount to reach all those areas you can’t normally get to. This one removes 300% more plaque along the gumline than a manual toothbrush. Why? Because it oscillates and pulsates to break it up! Guess what? That makes it great for braces, too! As electric toothbrushes go, this one is pretty simple. It only has one daily cleaning mode. And check this out: the handle vibrates every 30 seconds to tell you when to move to another part of your mouth during the 2-minute cycle. The round head is the perfect shape to concentrate on one tooth at a time. 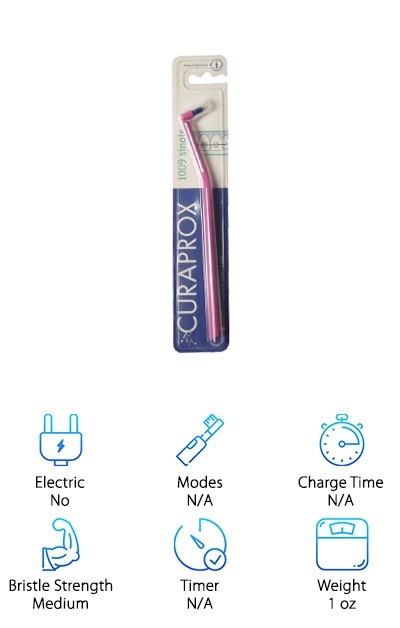 Have you ever wanted a toothbrush that you could sync to your smartphone? Well, you’re in luck. The Philips Sonicare DiamondClean Toothbrush is the most high-tech toothbrush we came across. There are lots of great things about this one. It removes 10 times more plaque than a manual brush. 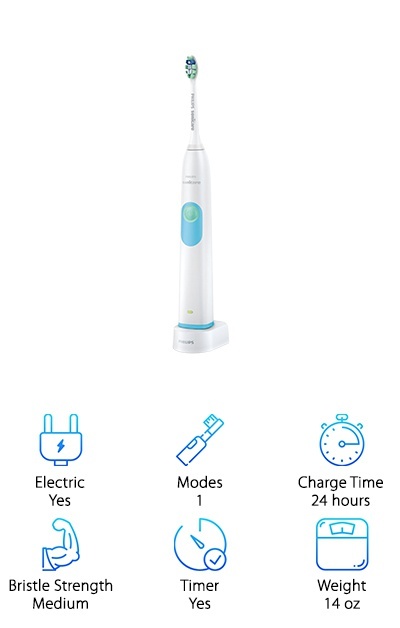 It has 5 modes (clean, white+, deep clean+, gum health, and tongue care) plus 3 intensity levels. It brushes at up to 31,000 strokes a minute. But let’s get to what you really care about: the tech. You sync this to an app on your smartphone. Then a sensor shows you where you’re already brushed and where you missed, right on your phone screen. If you’re pushing too hard, the sensor will also remind you to lighten up and let the brush do the work. When you look at this one, you’re probably wondering what on Earth we’re talking about. Yes, we know it looks a little odd. But trust us, this thing is effective. It’s small and thin with the perfect rounded tuft of bristles and filaments at the end. Think about it: this is literally the perfect shape to work in between your braces and teeth. It also gets in close to the gumline in a way that no manual toothbrush can. If you combine this brush with a flat manual brush that can quickly tackle the surfaces, the Curaprox can get to all the little places that are so important to clean when wearing braces. They’ve also stood the test of time. These have been designed and made in Switzerland since 1972!